Salisbury is the world leader in Electrical Safety PPE and live line tools. For over 150 years, our products have helped protect electrical workers from the hazards of their job. Salisbury By Honeywell is a complete Personal Protective Equipment (PPE) provider for all electrical workers against electrical hazards as defined by OSHA Regulations and the NFPA 70E Standard for Electrical Safety in the Workplace. On April 1, 2014, OSHA announced a final rule revising the standards for electric power generation, transmission, and distribution. Prior to this revised rule, arc flash protective clothing was subject to limited regulation and was primarily driven by standards such as NFPA70E and NESC. 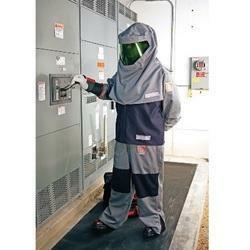 Look to Salisbury to provide your arc flash protective clothing required by the OSHA Ruling. • FR clothing is defined as clothing that does not melt, ignite, or contribute to the injury of the wearer. • Arc rated clothing is required whenever the calculated energy is greater than 2.0 cal/cm2. • Arc rated clothing must cover the entire body with an exception for hands, feet, and head protection. • If employees face a single phase, open air exposure 9-12 cal/cm2, a face shield is required; exposures greater than 13 cal/cm2 require a face shield + balaclava or arc rated hood. • If employees face a three phase exposure 5-8 cal/cm2, a face shield is required; exposures greater than 9 cal/cm2 require a face shield + balaclava or arc rated hood. The NFPA 70E Standard and OSHA Regulations have been established to protect workers from electrical shock and arc flash hazards and to educate workers about the protection needed from these dangers. For example, the NFPA 70E Standard specifies areas where arc flash protection is required for workers involved in the maintenance of energized or potentially energized electrical equipment. All personnel within the defined boundaries must wear specified protective equipment, even on circuits as low as 50 volts. The NFPA 70E Standard and OSHA Regulations MUST be met, and Salisbury has made it easy to meet them. To ease the burden of meeting all the necessary safety standards and requirements, we’ve developed convenient Personal Protective Equipment Kits. Meet current ASTM F1506 and NFPA 70E 2012 standards. 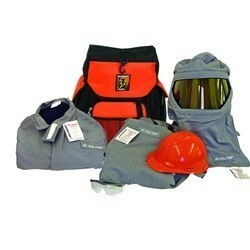 Kit Includes Coat, Bib Overalls, Pro-Hood, Hard Hat, Storage Bag and Safety Glasses. 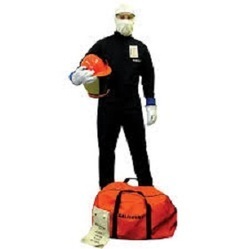 Kit Contains 8 Cal/cm2 Coverall , AS1000HAT, AFHOOD, storage bags and safety glasses. Looking for Arc Flash Protection ?